Did you miss Day One? Click here to read it. Day Two began, as all our days did, with a hearty breakfast buffet to satisfy hungry Americans: a selection of regional ham and cheese, eggs, pastries, fruit, cereals, yogurt, juices, coffee American (which is comically described there as “weak” and “large”) or cappuccino, or coffee (espresso). 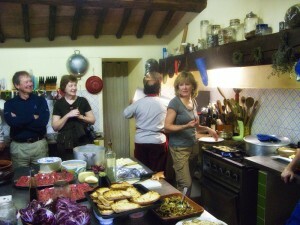 Our guides said that Italians will just have coffee and a pastry or a piece of toast to start the day. Well, hey, “we’re on vacation”! And who can pass up Italian ham and cheese? 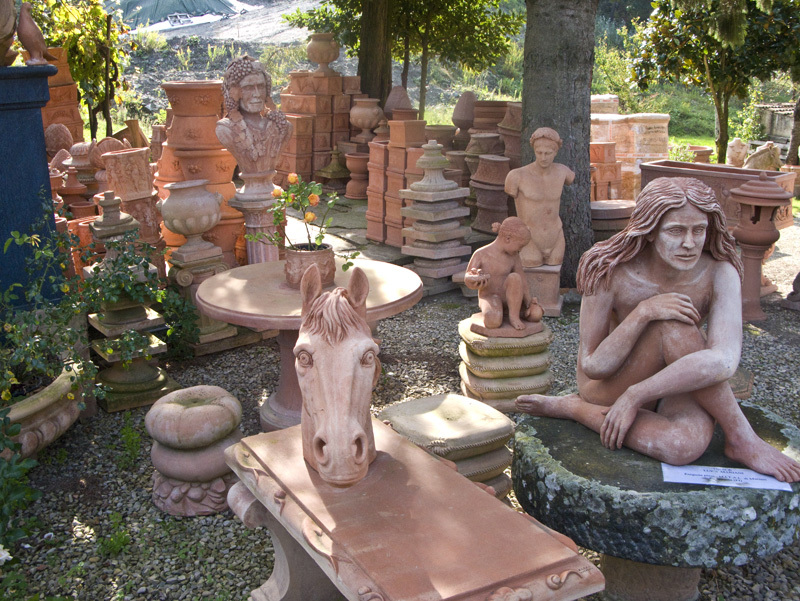 We stopped to visit a local artisan who still crafts terra cotta pots by hand. He apologized that he only had one craftsman working that day, as the others were all out harvesting the grapes in his adjacent vineyard. 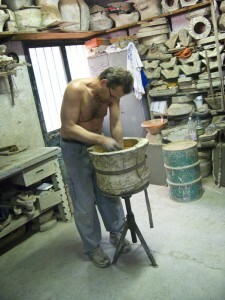 We were given a demonstration of the actual handthrown method, as well as a pot being taken out of a mold. Tuscany has the perfect soil for making terra cotta pottery. 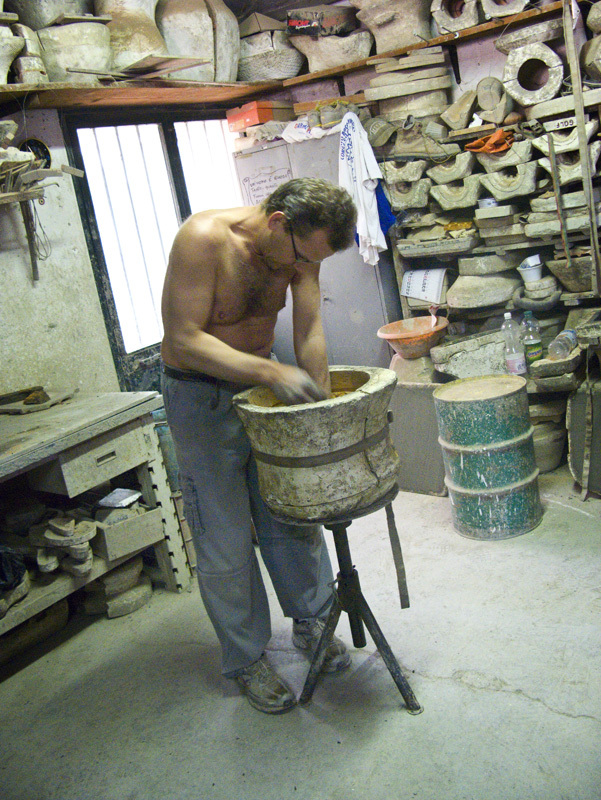 We passed many other similar businesses on the way to our hiking destination. Before lunch, we took a lovely 1 1/2 hour walk through a part of Tuscany that – once abandoned – is now being bought and refurbished and sold as a) rentals for vacationers and also b) to people who want to “return to their Tuscan roots”. 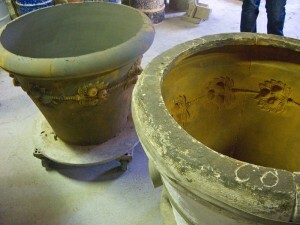 it is all being carefully restored in very strict adherence to original style. These parcels of land are being sold for well over a million dollars. Seriously, it looked just like a movie set! 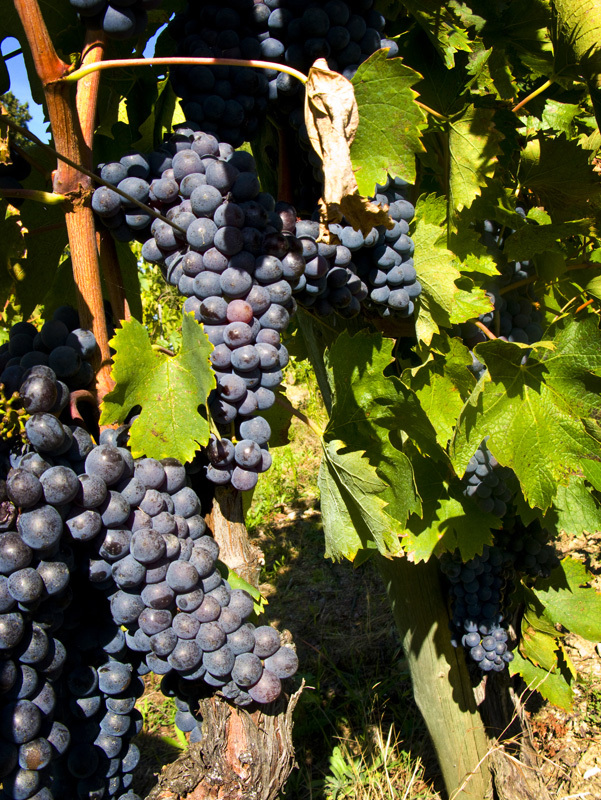 We hiked through a vineyard where Francesco told us about the Sangiovese grapes: Chianti wine must be made from at least 80% Sangiovese grapes. 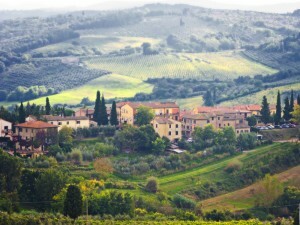 Chianti is divided into 7 regions; the largest is Classico. 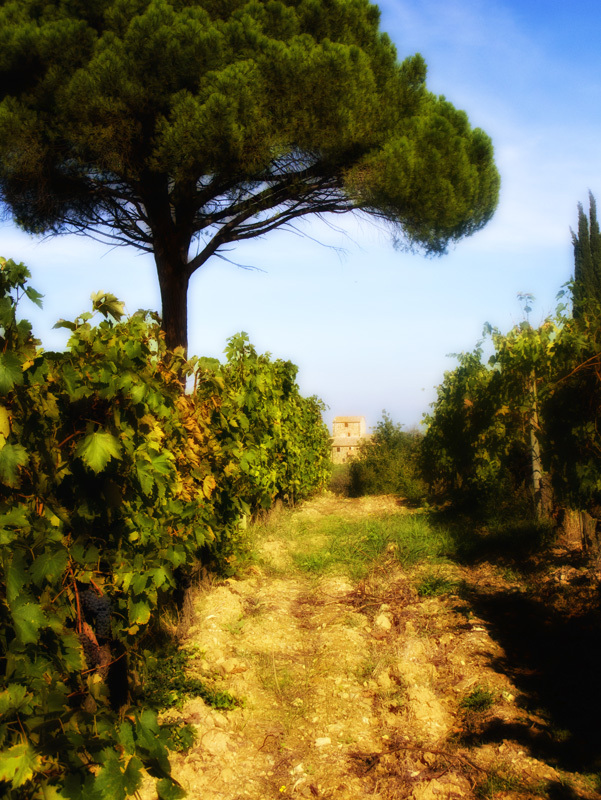 The black rooster on the label of a bottle of Chianti Classico is the assurance symbol of quality. It is also used to prevent wine fraud. 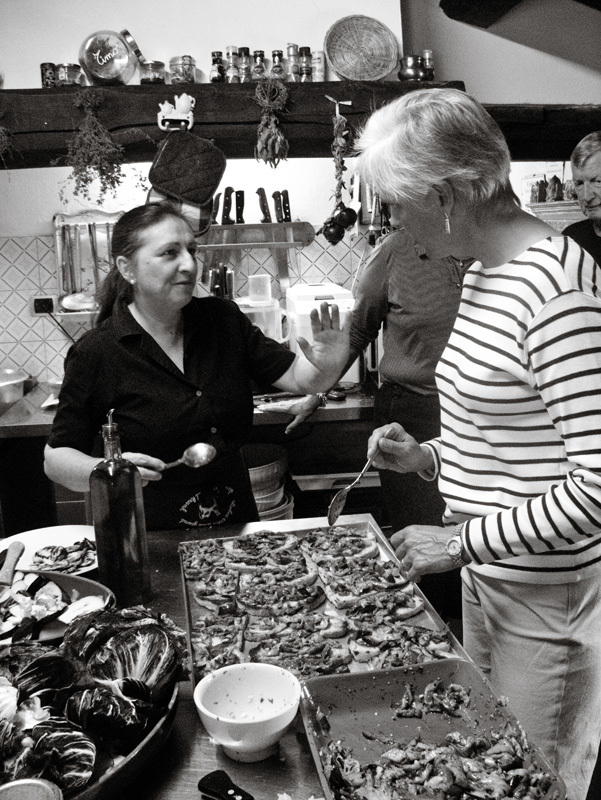 Our vineyard walk was the perfect transition to another cooking session, this time in a country house on the grounds of a 15th century castle. Feisty Patricia and her darling husband (he looked alot like Santa!) taught us how to make eggplant bruschetta (see photo below of Laura, Mary Lou and I making this dish), beef carpaccio with raddichio, Spelt (like a plump grained risotto with wine and chicken broth) as our pasta, and poached pears for dessert. Yes, you are wondering…. this was LUNCH! I’d never heard of Spelt before but this is definitely something we’ll be eating alot of in the future at our house. It was presented to us in big crockery soup bowls: steaming hot, buttery, plump and just slightly chewy. 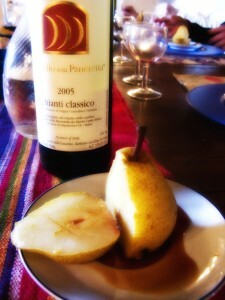 I KNEW this was just the first “pasta” course and that I should refrain from eating it all – HA – fat chance! Once again, I could have just eaten two huge bowls of this and been satisfied for the rest of the day! Ditto with the eggplant bruschetta. Such simple food, so beautifully prepared and presented. 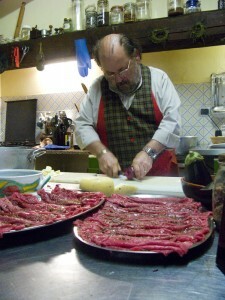 Combine that with the fun atmosphere of the cooking session (Mike had such fun learning to cut with the two handled curved mezzaluna), the growing camaraderie of our group, the incredible charming surroundings of Patricia’s cucina and dining room, the “pinch me – am I really here?” view out the window. The constant appearance of a fresh bottle of Chianti Classico on our table….. you get the picture! 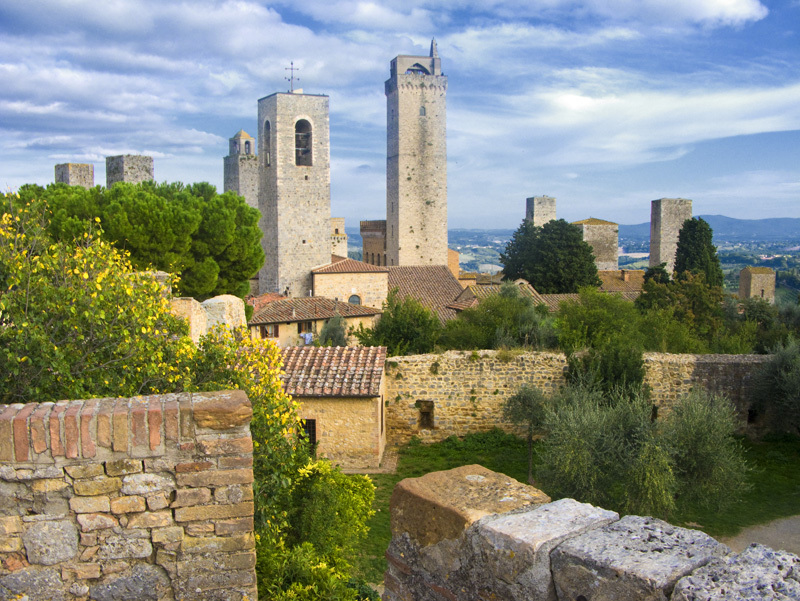 Time to board our little bus and travel to our final destination of day two: San Gimignano, the ultimate hill town with its fantasy skyline of 14 medieval towers. 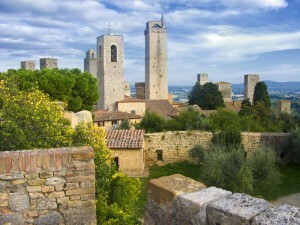 Most all of the towers in Florence and Bologna were brought down due to wars, catastrophes, or urban renewal, but San Gimignano managed to conserve 14 of theirs. Constructed originally for defense, the towers grew into the world’s most photogenic example of one-upmanship as family after family sought to out-build its peers. The 1999 movie “Tea with Mussonlini” was filmed here. 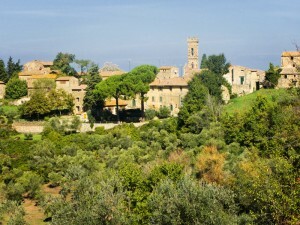 As with all the medieval villages we visited, it is atop a “hill” (we would call it a foothill in our country). Buses must park near the bottom. There is only one way up – on foot. At this point, I was so glad we took the advice of Classic Journeys and bought the prescribed hiking boots. 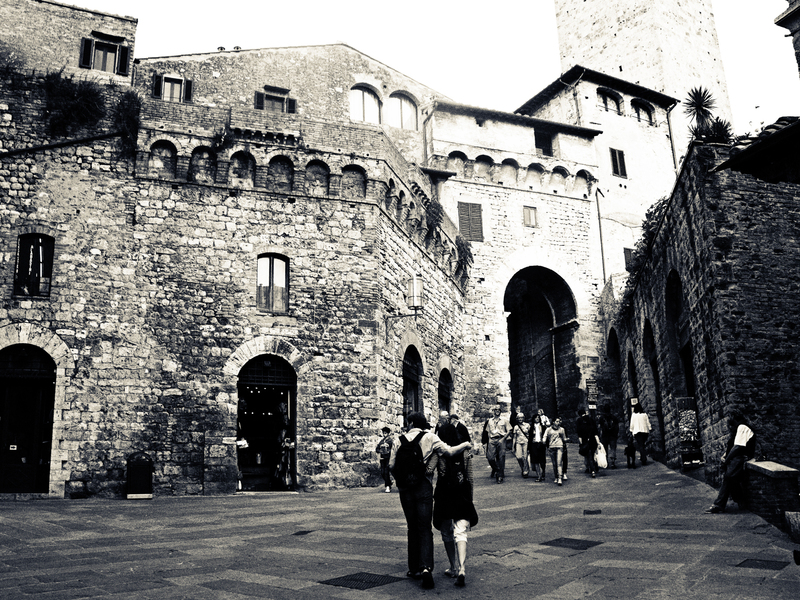 The cobblestones are ancient and uneven – you must always watch where you are stepping. 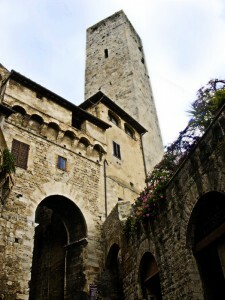 At the top, we marvelled at the far-reaching vistas and the towers. 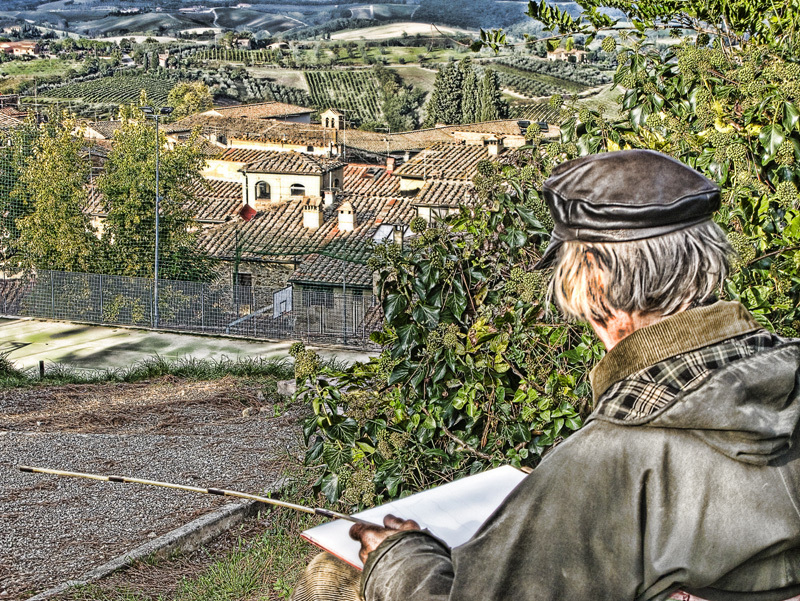 (see photo below) I saw an old man sketching and decided to photograph him and turn the photo into a sketch. I really like the results! Thank goodness for all the walking this day: when we returned to the city, we were told that we would visit a local trattoria for dinner: antipasto, THREE kinds of pasta, steak, sausage, potatoes, lots of chianti wine. Profiteroles with chocolate sauce for dessert. ‘nough said. Goodnight! Day Two photography notes: a rare clear day with blue skies couldn’t have happened on a better day for photographing the Tuscan countryside. I tried to do some “impressionistic” painting effects on some of the countryside photos and “old grungy” effects on the medieval city. I used to paint a bit, and love mixing photography with Photoshop painting effects and filters. 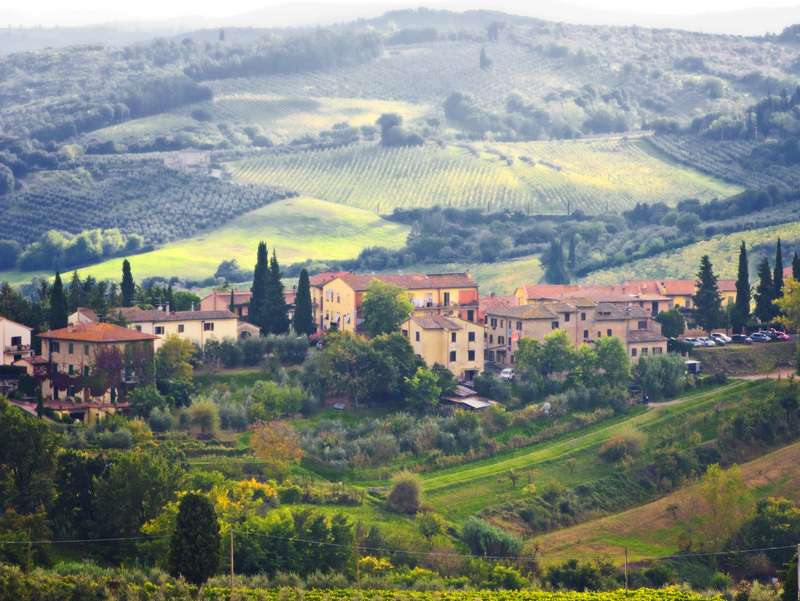 Tuscany looks like a patchwork quilt of different colors and textures. 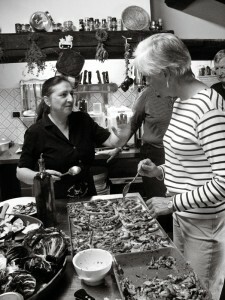 Laura assembling the eggplant bruschetta under Patricia's watchful eye. Note the hand gestures! 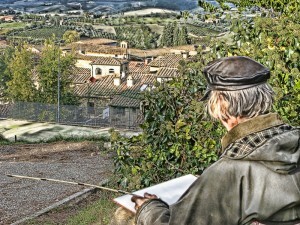 As we were returning to our bus, we came upon this artist sketching the countryside. I wanted my photograph to also resemble a sketch. Well… I am going to go cook my dinner of very traditional chicken thighs with rice and veggies. A favorite of mine that you gave to me years ago. Look how far you have come! We continue to enjoy your travel log and await the next installment.